Even if you don't think you have "sensitive" skin, what's happening where you can't see it is an entirely different story. Slowly but surely and often hidden from view, harsh skincare ingredients, pollution, unprotected sun exposure, and other environmental factors can wreak havoc on your skin. Over time the silent impact of these hostile skin attackers cause untold problems including dry rough skin, redness, enlarged pores, uneven skin tone, a loss of firmness, and make skin looker older and tired. The best way to combat all this and get your skin back to normal vibrant health is to only use gentle, soothing skin care products and a sunscreen. Without question this is something we should all be doing. Now is the time to get the best skin of your life and it starts by knowing which products will embrace your skin with soothing properties. Below are the research-supported recommendations to get your skin looking its best and staying that way. Unprotected sun exposure is at the top of the list for aggravating skin, hence daily SPF is a must! Red, peeling skin and uneven skin tone are clear indications that skin has been affected, but other less obvious environmental factors may be at play, including air pollution or arid conditions. Perhaps the least obvious, yet most common, skin assaulter is fragrance (whether synthetic or natural) in your personal care products. While many people want products that smell good, the way most fragrance ingredients impart scent is through a volatile reaction, which can cause, you guessed it, skin sensitivity. Harsh scrubs and hot water will also take an unwanted toll on having the beautiful skin you want. All these factors deplete skin and the impact is more than just redness or discomfort. It can thwart skin's ability to replenish and renew itself, lessens resiliency, impedes hydration, causes dullness, and overall makes skin less able to be healthy and radiant. For those with oily skin, these kinds of assaults on skin can also spur more oily shine and enlarged pores. SKIN RECOVERY Softening Cream Cleanser – A rich, creamy cleansing formula that feels cushiony-soft and soothing on skin while still cleansing thoroughly. CALM Redness Relief 1% BHA Exfoliant – This extremely gentle leave-on lotion exfoliant containing a 1% concentration of BHA (salicylic acid) helps alleviate redness while also unclogging pores and smoothing rough, bumpy skin including stubborn, tiny, hard white bumps that occur primarily on your cheek bones but can show up in other areas too. It's even suitable for milia-prone skin. CALM Redness Relief Repairing Serum – This lightweight, all skin types serum immediately soothes temperamental skin and calms redness with gentle, yet highly effective antioxidants and skin-replenishing ingredients. SKIN RECOVERY Daily Moisturizing Lotion – This gentle, moisturising mineral-based sunscreen provides broad-spectrum protection as well as additional antioxidants to help reduce the risk of early skin ageing, as well as a bevy of other benefits too long to list. CALM Redness Relief Moisturizer for Normal to Oily Skin – If you have normal to oily skin finding the best sunscreen to protect your skin and keep it looking young and healthy is tricky because most sunscreens are anything but lightweight. Our CALM Redness Relief will change your mind and your skin at the same time. CLINICAL Ultra-Rich Moisturizer– A specialised cream designed for the face, this incredibly rich formula helps replenish skin and defends against moisture loss for up to 12 hours. Moisture Renewal Oil Booster Is an ultra-hydrating, skin nourishing blend of pure plant oils that's also infused with skin sustaining ceramides. This concentrated combination of antioxidant enriched facial oils is nourishing enough to alleviate dry, sensitive, red-looking skin and is suitable even for rosacea-prone skin. 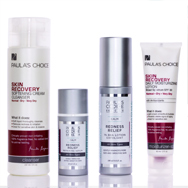 For more Paula's Choice products geared to sensitive skin and specific for your skin type, see our entire CALM Redness Relief collection.